The 40th annual College All-Star Game on July 27, 1973 featured the Miami Dolphins, undefeated NFL Champions of the 1972 season, against a group of All-Stars coached by John McKay of USC. The Dolphins, under Head Coach Don Shula, featured a ball control offense led by power-running FB Larry Csonka (pictured at right), and QB Bob Griese was capable of throwing passes to good effect when necessary. The “No Name” defense was often overlooked but allowed few points. However, injuries were a problem coming into the All-Star Game. MLB Nick Buoniconti had just undergone surgery on his wrist a week earlier, but was forced to play the whole game because of injuries to linebackers Bob Matheson, Mike Kolen, and Doug Swift. The All-Stars contained future NFL standouts in QB Bert Jones from LSU; running backs Chuck Foreman of Miami, Terry Metcalf from Long Beach State, and Oklahoma’s Greg Pruitt; TE Charle Young of USC, and Alabama G John Hannah on offense. The defense included ends Wally Chambers of Eastern Kentucky and John Matuszak from Tampa, Miami CB Burgess Owens, and LB Jim Youngblood of Tennessee Tech. Coach McKay took a relaxed approach to preparing for the game with one practice per day, instead of the usual two, and had few rules. The collegians alternated front lines and used many players on both platoons. There were 54,103 fans in attendance at Chicago’s Soldier Field on a Friday night. Miami took the opening kickoff and drove 60 yards in ten plays. Bob Griese threw just one pass along the way and Larry Csonka ran around right end for a three-yard touchdown to finish the series off. Garo Yepremian added the extra point. The All-Stars had opportunities to score but failed to capitalize. They had a first down at the Miami 13 but Greg Pruitt fumbled and DT Manny Fernandez recovered for the Dolphins to snuff out the threat. In the second quarter, LB John Skorupan of Penn State intercepted a Griese pass and returned it 30 yards to the Miami 30. However, a 16-yard sack of Bert Jones moved the collegians out of scoring range and Ray Guy from Southern Mississippi was forced to punt. Near the end of the first half, the All-Stars, starting from their 38 with Jones behind center, reached the Miami one yard line, but the Dolphins kept them out of the end zone and they settled for a 10-yard field goal by Guy. A key play occurred when injured FB Sam Cunningham of USC was sent in to attempt a leap into the end zone, but a five-yard penalty nullified the effort. The Dolphins maintained a 7-3 lead at the end of the half. A heavy rain doused the stadium at halftime and the artificial surface was slick in the second half. The All-Stars had another break in the third quarter when Florida State DB James Thomas recovered a fumbled snap at the Miami eight. But the collegians again couldn’t punch the ball in and Guy’s 16-yard field goal try was missed. On the first play of the fourth quarter, Jones fired a pass that traveled 60 yards and was intended for WR Barry Smith of Florida State, who had a step on his defender as he sprinted down the left sideline, but the ball went through his hands at the Miami 20. On the next Baltimore series, 39-year-old backup QB Earl Morrall (pictured at left) came into the game and directed a 55-yard scoring drive in seven plays. 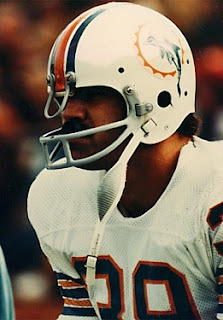 Morrall connected with TE Jim Mandich for two key completions and Csonka again finished off the possession with a seven-yard TD carry. Yepremian added the point after and, for all intents, the win was clinched for the Dolphins. Despite Miami’s sluggishness, the All-Stars failed to threaten again and the final score was 14-3. The Dolphins outgained the All-Stars (251 yards to 133) and had more first downs (16 to 9). Of the total for the All-Stars, only 13 yards and one first down came in the second half. Miami turned the ball over twice, to one suffered by the collegians. Larry Csonka was the offensive star for the Dolphins, rushing for 76 yards on 17 carries and scoring both touchdowns. 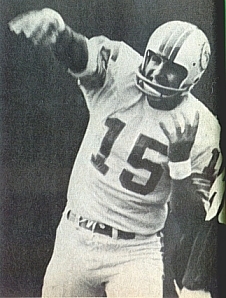 Bob Griese completed 6 of 9 passes for 75 yards and had one intercepted while Earl Morrall was three of four for 38 yards. HB Jim Kiick had four catches for 24 yards and Jim Mandich led the club with 35 yards on two receptions. Bert Jones played most of the game at quarterback for the All-Stars and completed 9 of 17 throws for 79 yards. Purdue HB Otis Armstrong led the runners with 39 yards on 11 attempts. Ray Guy punted nine times for a 44.1-yard average and helped keep the Dolphins from getting good starting field position, in addition to scoring the only points for the collegians. Miami’s win marked the tenth straight for the pro teams and put them ahead in the series by 29 to 9. The Dolphins repeated as NFL Champions in 1973, but failed to return to the College All-Star Game when it was cancelled due to a players’ strike during the ’74 preseason. While Ray Guy both placekicked and punted for the All-Stars, he had been chosen by the Oakland Raiders in the first round of the NFL draft strictly for his ability as a punter. He would go on to a 14-year career, all with Oakland, and was named to the Pro Bowl in each of his first six seasons (seven overall). In 2014, Guy was inducted into the Pro Football Hall of Fame.